This celebration comes at a fantastic time for diddi dance as their recognition across the UK continues to grow. 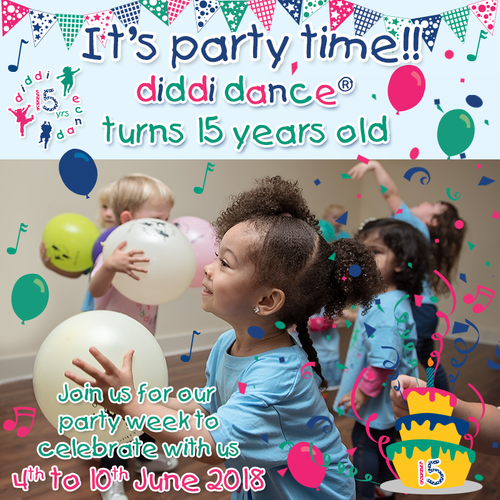 Seen as one of the leading providers of preschool dance classes, diddi dance has been featured on Strictly Come Dancing, held partnerships with Little Dish & PJ Masks, worked with charities such as MacMillan Cancer Support & Youth Sport Trust, won many top industry awards and been the go-to class for celebrities such as Amanda Holden, Sara Cox, Katie Price & many more. Why not join the dancing fun today with a FREE trial in any diddi dance class! diddi dance was created by Anne-Marie Martin, a professional dancer with over 20 years of teaching experience. After running for fifteen years in London, diddi dance is now available at over 40 locations across the UK. Classes are designed to build confidence, co-ordination, rhythm, fitness, gross motor skills and social skills, welcoming all little ones from the age of 16 months up to five years. The weekly 45 minute fun-filled sessions cover a variety of dance styles, from hip hop to country through to salsa and rock and roll so every child’s taste is catered for. Bookings are taken in half term blocks and toddlers can have a free trial of the class before signing up. This press release was distributed by ResponseSource Press Release Wire on behalf of Diddi dance in the following categories: Children & Teenagers, Entertainment & Arts, Education & Human Resources, for more information visit https://pressreleasewire.responsesource.com/about.